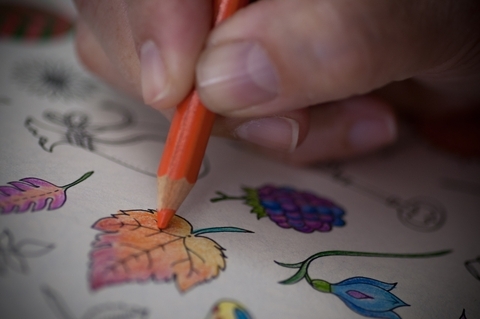 Well, who’d have thought adult colouring books would be the latest craze to sweep the country? Adults (grown ups shall we say) are clamouring in their thousands to get the pencils, felt tipped pens and crayons out to colour in the outline drawings in the books. Apparently we do this for stress relief and after a hard day at work in the office, to get some relaxation and wind down. Although I did read one person comment that if you colour outside the lines your stress levels will raise due to the frustration of getting it wrong. There are so many different colouring books available on the adult market (and many are very similar) that it’s difficult and a little pointless to review a single one, although popular copies which seem to be best sellers in the arena are Millie Marotta’s Animal Kingdom – A Colouring Book Adventure, Enchanted Forest: An Inky Quest and Colouring Book, The Mindfulness Colouring Book: Anti-stress art therapy for busy people, Secret Garden: An Inky Treasure Hunt, to name but a few. The books come in paperback form by various authors / artists and contain pages with either a story which you follow as you colour the pictures in, or a variety of different topics, one such topic would be a book for cat lovers, “Cats: 70 designs to help you de-stress” – a whopping Seventy feline pictures of to fill in. You can take the hobby to any level you feel appropriate, IE your colouring skills may start out on the flaky side, given it’s probable that you won’t have done any colouring in since you were five years old, so the finished pictures may not look that good. Over time though if you stick with it and get your arty hat on, you can produce some really detailed artwork which may even be worthy of putting in a picture frame and hanging on a wall. No matter how steady your hand, one way or the other you are looking at some extremely intricate work (although there is generally a range of complexities available in any given compilation so start off with the simpler ones and work up from there) once one is coloured in – move on to the next. You will see just by glancing at the page that the designs are going to take a long time to complete, but once you “sink into” filling in the colours, you’ll find that it is indeed a great way of taking your mind off things. We found that if you don’t concentrate, the final drawing will look a mess – so focus is required and this is where you begin to relax, because the artwork and creativity required will destract you from the more depressing or stressful features of the day! Our advice regarding the type of pencil or pen you use would be to use felt tipped pens for the basic designs, giving stronger pictures (and you don’t really need to worry about streaking because most of the shapes which need filling in are very small). For the more complicated colouring designs and illustrations, very sharp tipped coloured pencils are worth giving a try and tend to produce a more pastel effect, which in itself is pleasing to the eye on completion. When choosing a book, some of them mention “bleed through” which is where the ink goes through the paper due to its low viscosity – try and find a book which specifically mentions a thicker grade of paper if this could be an issue with the pens you are going to use. Good quality paper – go for the thicker specification. A range of designs – keep in mind interest levels and what you actually want to achieve. Topic of the book – if you like dogs – get a dog book! 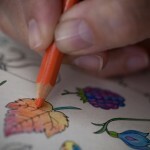 Drawing media – consider how your final pictures need to appear when choosing to use ink or pencil. Time – how much time you have available is important as coming back to a picture too many times can be tedious. Every individual is different, for some this will produce a calming effect for others it just won’t – we rate this aspect of the activity at 6 out of 10 – but are sure others will give it 10 out of 10 at the drop of a hat! 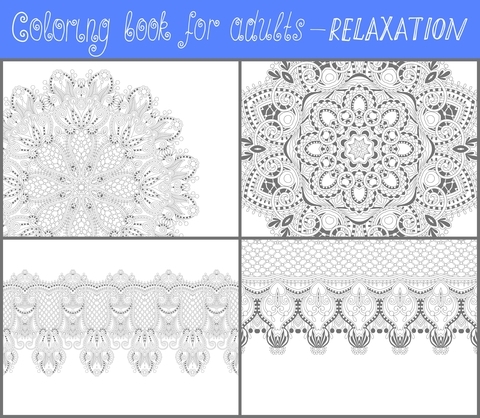 Colouring books for adults - relieve stress? - Produce a collection over time. - Make wall mounted coloured pictures. - May annoy you if you get it wrong!